OK, let's brainstorm how to create a moral economy - but keep human nature in mind. We need to reduce economic inequality, but within reason - there will always be some who have more money than others, there will always be jobs that pay better than others. That's the way of the world. We need to reward those who care for the environment, while accepting that we are going to have some impact on the environment - we can't take that down to zero, only take reasonable measures to reduce our individual burdens on the planet. The pope is as radical as Bernie Sanders. Morals are our problem. Money rules over the people, controlling, using and abusing them unto death. Corruption in every nook and cranny of governments and other positions of power. The money stays with the 1% and trickles down--only there's a knot in the pipe. The one percent continue to destroy our environment and ignore addressing Climate Control. On each and every point, I do agree with the pope---and Sanders. I think yesterday was too late, however, to take action--never mind going through red tape, planning, allotting who does what and when. They'll find out. This current Pope is just what the progressive world requires. He makes sense and appears to be in touch with his public. A moral economy would need to be a balanced economy where right-wing egoism in the form of control and competition aren't running the show. Right-wing politics and policies combined with egoism and rich power-possessors have completely ruined the economies and communities of the world, turning man against man, woman against woman. It's entirely unhealthy and unbalanced. Over 2500 years ago, Confucius taught the foundations of a moral state, based on certain principles. One of the most basic is respect, and a version of the Golden rule, based on empathy. It says do not do something to someone else which would be hurtful to you. In this philosophy, a leader acts as a role model to those that he leads. We could benefit greatly from implementing these kinds of principles. Right now, our country is operating in pretty much an amoral way. It's every man for himself, with Hillary's favorite excuse, everybody else is doing it. Darren points out our current state of affairs in which power and wealth of the few is destroying the well-being of the world's people. Unfettered capitalism leads to extremes of competition and feeds the egos of those who dominate. These elements are the basis of empires, which of course, are doomed to eventually fail. The well-off around the world now have so much money, they "salivate for new things to buy." (and, also, politicians). 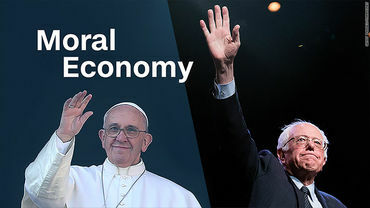 Both the Pope and Bernie believe an ethical financial system includes building a clean, green environment. And, when criticized that they have no "concrete solutions," this is a total lie. Both want to end corruption and self-serving tax evasion. It's like those in power have their fingers in their ears, whining like little 2-yr. olds...."Wah-wah-wah, I can't hear you." Makes me sick to death! Darren says it all. Thanks. 'Pope Francis spells out five key points in his many speeches and letters. Pope Francis says the world has an "economy of exclusion" that is literally killing people because they don't have shelter or enough to eat even though food gets thrown away in many places. He goes as far as to say "trickle down" economics isn't working, and he encourages world leaders to not shy away from some re-distribution of wealth. Pope Francis points out how the well off around the world salivate for new things to buy. "The culture of prosperity deadens us" to what truly matters in life. Instead, we run after material things, many of which will be thrown away. He says this is a cultural and moral problem. The Bible warns against the worship of idols such as a golden calf, but Pope Francis says the world has "created new idols" that are even more ruthless such as money. As he wrote in his famous address ("Evangelii Gadium") at the end of 2013: "How can it be that it is not a news item when an elderly homeless person dies of exposure, but it is news when the stock market loses two points?" He says money must serve, not rule, over people. In addition to calling out inequality, Pope Francis has increasingly criticized world leaders for allowing environmental destruction. "The Earth, our home, is beginning to look more and more like an immense pile of filth," he said. Pope Francis believes the technology and will is in place to change our ways. Related: Why doesn't 4.9% unemployment feel great? In late 2013 -- long before the Panama Papers -- Pope Francis called for an end to "widespread corruption and self-serving tax evasion, which have taken on worldwide dimensions." How to fix the problems? Pope Francis and Sanders have both been called "radical" for what they are saying. "People say Bernie Sanders is radical? Uh-uh. Read what the Pope is writing," Sanders said recently on MSNBC Morning Joe. But both of them have also been criticized for not providing enough concrete solutions. Sanders tried to rebut that in his speech at the Vatican on Friday. Bernie handled himself well in Rome 1.0. Now he has to return to Rome 2.0 and win NY. Taxes are high in Scandinavian countries, but you get a lot back for those taxes. My son tells me that anyone in Norway can find out how much tax a person has paid - it's all available online! Nyack, did he have any choice? I'm sure if there were planes using renewable energy he would have chosen them - but there aren't. I don't like the fossil fuel industry either, but I drive a car. Given where I live (no public transport) I have no choice, but I look forward to the day that changes. It obviously is not feasible or practical to support an instant end of fossil fuel use. t is feasible, practical, and desirable to make people and corporations pay taxes proportional to their income. Indeed, in Denmark where there is an excellent safety net for everyone, most of the wealthy do not mind paying high taxes. Living in a safer, saner, and cleaner country benefits all. It's really common sense. Correction: I meant to say Norway, not Denmark. Most of the Bad Guys of the Empire will die soon. Their empires will be broken, plundered and fought over. In the meantime, does any one remember how important Birth Control around the Whole Wide World is ? Does Clinton receive billions from the Big Bankers and the Barons of Wall Street to protect US from that idealogue Bernie Sanders...you bet she does...She is bought property of Goldman Sachs et all...so that they can continue to live off of the rest of us, destroy by greed the earth and all life.....like the parasites they always have been?